The ultimate guide to investing in property...and making a million! Everyone's looking to get rich, and a lot of those people are looking at investing in property as the way to get there. But watch out—making money in real estate isn't always as easy as it might look. At least, not without Your Property Success with Renovation in hand, that is. Written by Jane Slack-Smith, a true investment guru who's put together her own multi-million dollar property portfolio, this is the ultimate guide to making the housing market work for you. Loaded with no-nonsense advice to help you avoid the traps that so many would-be real estate investors fall into, Your Property Success with Renovation introduces a unique three-pronged, low-risk investing strategy. Rather than focusing on fast money, the book encourages a low-risk plan—find an area with above average capital growth, buy below market value, and build value through renovation—that will help you build a strong, profitable real estate portfolio. With just two investment properties and one renovation the average Australian can put a million dollars in the bank within fifteen years, and mortgage broker Jane Slack-Smith is here to show you how. JANE SLACK-SMITH amassed a multimillion dollar property portfolio that started with an initial investment of just $45,000. In 2005 she founded Investors Choice Mortgages and in 2010 she was awarded ‘Mortgage Broker of the Year’ by Your Investment Property magazine. 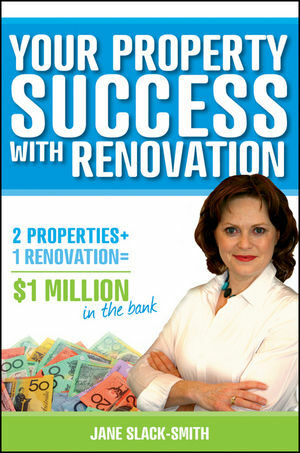 Visit Jane’s website at www.yourpropertysucessnow.com.au for more information.